What guidelines should be considered for maintaining full-text indexes? Should I REBUILD or REORGANIZE the full-text catalog (see BOL)? What is a reasonable maintenance cadence? What heuristics (similar to the 10% and 30% fragmentation thresholds) could be used to determine when maintenance is needed? There are a lot of resources on b-tree index maintenance (e.g., this question, Ola Hallengren's scripts, and numerous blog posts on the subject from other sites). However, I have found that none of these resources provide recommendations or scripts for maintaining fulltext indexes. There is Microsoft documentation that mentions that defragmenting the b-tree index of the base table and then performing a REORGANIZE on the full-text catalog may improve performance, but it doesn't touch on any more specific recommendations. I also found this question, but it is primarily focused on change-tracking (how data updates to the underlying table are propagated into the fulltext index) and not the type of regularly scheduled maintenance that could maximize the efficiency of the index. Even though the update statements in this script were fairly contrived, this data seems to show that there is a lot to be gained by regular maintenance. I'm thinking about creating a nightly or weekly task. It seems that this task could perform either a REBUILD or REORGANIZE. Because the full-text indexes may be quite large (tens or hundreds of millions of rows), I'd like to be able to detect when indexes within the catalog are sufficiently fragmented that a REBUILD/REORGANIZE is warranted. I'm a little bit unclear on what heuristics might make sense for that. I wasn't able to find any good resources online, so I did some more hands-on research and thought it would be useful to post the resulting full-text maintenance plan we are implementing based on that research. 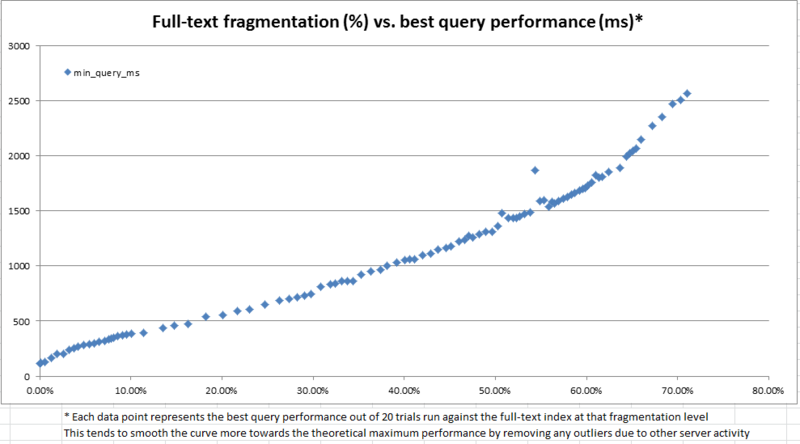 Our primary goal is to retain consistent full-text query performance as data evolves in the underlying tables. However, for various reasons it would be difficult for us to launch a representative suite of full-text queries against each of our databases each night and use the performance of those queries to determine when maintenance is needed. Therefore, we were looking to create rules of thumb that can be computed very quickly and used as a heuristic to indicate that full-text index maintenance may be warranted. In the course of this exploration, we found that the system catalog provides a lot of information about how any given full-text index is divided into fragments. However, there is no official "fragmentation %" computed (as there is for b-tree indexes via sys.dm_db_index_physical_stats). Based on the full-text fragment information, we decided to compute our own "full-text fragmentation %". We then used a dev server to repeatedly make random updates of anywhere between 100 and 25,000 rows at a time to a 10 million row copy of production data, record the full-text fragmentation, and perform a benchmark full-text query using CONTAINSTABLE. The results, as seen in the charts above and below, were very illuminating and showed the the fragmentation measure we had created is very highly correlated to the observed performance. Since this also ties out with our qualitative observations in production, this is enough that we're comfortable using the fragmentation % as our heuristic for deciding when our full-text indexes need maintenance. We have decided to use the following code to compute a fragmentation % for each full-text index. Any full-text indexes of non-trivial size with fragmentation of at least 10% will be flagged to be re-built by our over-night maintenance. 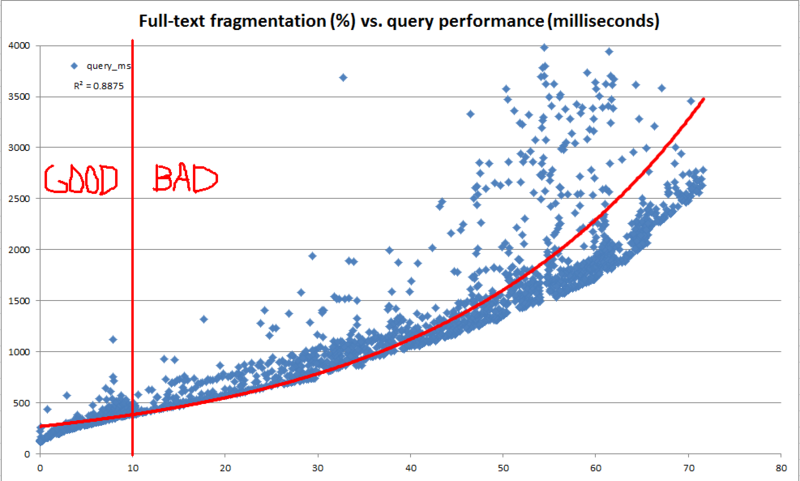 -- Apply a basic heuristic to determine any full-text indexes that are "too fragmented"
These queries yield results like the following, and in this case rows 1, 6, and 9 would be marked as being too fragmented for optimal performance because the full-text index is over 1MB and at least 10% fragmented. We already have a nightly maintenance window, and the fragmentation calculation is very cheap to compute. So we will be running this check each night and then only performing the more expensive operation of actually rebuilding a full-text index when necessary based on the 10% fragmentation threshold. SQL Server offers REBUILD and REORGANIZE options, but they are available only for a full-text catalog (which may contain any number of full-text indexes) in its entirety. For legacy reasons, we have a single full-text catalog that contains all of our full-text indexes. Therefore, we have opted to drop (DROP FULLTEXT INDEX) and then re-create (CREATE FULLTEXT INDEX) on an individual full-text index level instead. It might be more ideal to break full-text indexes into separate catalogs in a logical way and perform a REBUILD instead, but the drop/create solution will work for us in the meantime. Not the answer you're looking for? Browse other questions tagged sql-server full-text-search index-maintenance or ask your own question. When should I rebuild indexes? Reorganize full text catalog is offline or online? Why is full text index falling behind?